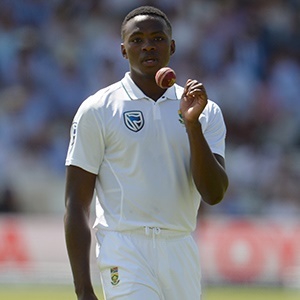 Cape Town - Proteas fast bowler Kagiso Rabada has dropped to third on the ICC Test rankings for bowlers. India’s Ravindra Jadeja, who took match figures of 5-84 against Sri Lanka earlier this week, replaced Rabada in second spot on the rankings. Australia’s Mitchell Starc has also returned to the top 10 in 10th position after his match figures of six for 128 against England helped him to gain three places. India’s Ravichandran Ashwin, who became the fastest man to 300 wickets in Tests, has consolidated his fourth position by gaining nine points which have put him on 849 points, 27 behind Rabada. Other bowlers to improve their rankings include Bhuvneshwar Kumar and Ishant Sharma of India, who have moved up one place each to 28th and 30th respectively, and Pat Cummins of Australia, who has jumped six places to claim 45th position. Dale Steyn is the other South African in the top 10, sitting in eighth position. Meanwhile, in the ICC Test rankings for batsmen, Australia captain Steve Smith extended his lead at the top of the rankings. Smith stroked a magnificent unbeaten 141, his 21st century in his 57th Test, which was the cornerstone of Australia’s 10-wicket victory over England in Brisbane. If Smith is able to produce another strong performance in the day/night Test at the Adelaide Oval, then he has a solid chance of leapfrogging Hutton, Hobbs, Ponting and May into second place behind Bradman. Among the other movers and shakers, India’s Cheteshwar Pujara has returned to the No 2 ranking after scoring 143 in his side’s huge victory by an innings and 239 runs in Nagpur. He had first peaked to second following the Ranchi Test against Australia in March, while the last time he was second was following his 133 against Sri Lanka in Colombo in August. Pujara has been rewarded with 22 points, which have lifted him from fourth to second on a career-high 888 points. The 29-year-old, who plays for Saurashtra in India’s domestic competitions, now leads his fifth-ranked captain Virat Kohli by 11 points. Kohli has vaulted from 817 points to 877 points after scoring his fifth career double-century in 62 Tests. England captain Joe Root is sitting third and New Zealand captain Kane Williamson is occupying fourth spot, while sixth-ranked David Warner of Australia is another 51 points behind Kohli. India opener Murali Vijay and middle-order batsman Rohit Sharma, who were the other centurions in the just-concluded Tests, have also made impressive gains. Vijay has risen eight places to 28thposition, while Rohit has shot up seven places to 46th spot. Other batsmen making upward movements in the latest rankings include Dinesh Chandimal 17th (up by six places), Moeen Ali 26th (up by three places) and Shaun Marsh 43rd (up by two places), while some of the leading batsmen heading in the wrong direction include Joe Root third (down by one), Lokesh Rahul ninth (down by one), Alistair Cook 14th (down by four), Ajinkya Rahane 15th (down by two), Dimuth Karunaratne 18th (down by one), Usman Khawaja 23rd (down by four), Shikhar Dhawan 29th (down by one), Angelo Mathews 30th (down by six) and Niroshan Dickwella 42nd (down by five). Hashim Amla (seventh) and Dean Elgar (10th) are the South African batsmen occupying the top 10.